Amazon surprised city planners across North America on Thursday by declaring it wants a second headquarters somewhere beyond its current base in Seattle. It told prospective suitors it would spend as much as $5 billion on the new site and hire up to 50,000, then gave cities and states just six weeks to submit bids. There are multiple sites in the Portland area that could fit Amazon’s needs, and regional economic development agencies plan a “coordinated response,” according to the Columbia River Economic Development Commission in Vancouver. Still, Portland faces some pretty long odds. Several cities, including Chicago, Pittsburgh, Toronto, St. Louis, Nashville and Philadelphia, immediately signaled plans to make a play for Amazon. That could signal a bidding war of tax breaks or subsidies. Oregon, with a relatively small economy, can’t match the corporate incentives large states like New York and Texas routinely dispense. Since Amazon sells across the country and around the world, it might balk at putting its second campus near Portland, which is less than 200 miles from its Seattle headquarters. And the region’s high-tech job market is relatively small and extremely tight, so it might be difficult or impossible for Amazon to find the workers it wants. Moreover, with the regional housing market and roadways already strained, metro leaders might find any incentives go over poorly with voters if the deals serve to push up home costs even higher and exacerbate existing traffic problems. Economic development boosters say they’re hopeful anyway, noting that Amazon already has a substantial Oregon presence. The company has a large complex of data centers in Morrow County, a sortation center in Hillsboro and fulfillment centers coming soon in Troutdale and Salem. An Amazon subsidiary, online video specialist AWS Elemental, employs hundreds in a downtown Portland office. That site includes several dozen employees from other Amazon departments. “They’ve certainly shown that they believe in this place through what they’ve done with Elemental,” said Nathan Buehler, spokesman for Business Oregon, the state’s economic development agency. A metro area with more than 1 million residents: Portland has 2.4 million. A “stable and business-friendly environment”: Oregon has some of the lowest business taxes in the nation. Companies pay almost no corporate taxes if they do most of their business out of state, Oregon has no sales tax, and it readily exempts large companies from local property taxes. However, the state’s own fiscal situation is a mess. 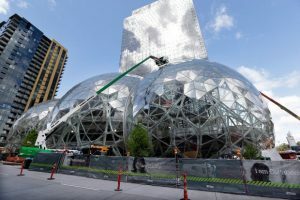 Washington has no personal income tax, and its existing corporate tax structure proved favorable as Amazon grew from a Seattle startup into one of the world’s largest companies. An urban or suburban area “with the potential to attract and retain strong technical talent”: Portland is one of the nation’s top draws for young, highly educated workers. However, it has no major research university and the region’s pool of tech workers is tiny compared with other tech hubs. A community that thinks “big and creatively” on potential sites: The region has a number of sites in the early stages of redevelopment that could be customized to suit Amazon. While Portland’s proximity to Seattle might work against a regional bid for Amazon, it could also be an asset. When Intel picked Oregon for a major expansion four decades ago, it did so in large measure because it wanted a site within a 90-minute flight of its corporate headquarters in Silicon Valley. Intel now employs more than 19,000 in Washington County, more than anywhere else it operates. Most handicappers, though, suggested Amazon will likely seek a region far from Seattle. Austin, Boston, Denver, Pittsburgh and Toronto made a number of lists of likely candidates. The Portland region went through this drill in 2012, when Nike contemplated a second corporate office on Portland’s South Waterfront, east Vancouver, or Austin. It ultimately chose to expand its campus near Beaverton after winning special legislation to lock in its current tax status for 30 years. Amazon needs a great deal of space – its current Seattle headquarters employ 40,000 in 33 buildings, 8.1 million square feet. That’s the equivalent of 56 average Costco warehouse stores. Amazon might look at some of the same places Nike considered, though its footprint might be too large for the South Waterfront real estate Nike looked at. The 174-acre former Hewlett-Packard campus in east Vancouver, though, still has plenty of space. Other possible sites might include the former mill site on Vancouver’s downtown riverfront, now in the early stages of development, or the 13-acre post office property in downtown Portland, awaiting a redevelopment plan. Jody Wiser, with the corporate watchdog group Tax Fairness Oregon, cautioned against a big tax giveaway. “If Amazon wants to come here, they really have to choose to come here,” she said. Wiser said that decision should be based on the region’s merits, not public incentives. She said local governments should limit their incentives to what they’d earn back in taxes from a business over a short, defined period. “That’s what all the states need to start doing, and the cities,” Wiser said. The Portland area added roughly 150,000 net jobs from 2012 to 2016. A 50,000-job infusion from Amazon surely wouldn’t happen that quickly, but could provide a substantial, long-term boost to the regional economy. With Portland-area rents and home prices soaring, and roads increasingly congested, another 50,000 jobs could add to the region’s burdens even as they increased prosperity. The content relating to real estate for sale on this web site comes in part from the IDX program of the RMLS™ of Portland, Oregon. Real estate listings held by brokerage firms other than Matin Real Estate LLC | Inspire Realty, LLC are marked with the RMLS™ logo, and detailed information about these properties includes the names of the listing brokers. Listing content is copyright © 2019 RMLS™, Portland, Oregon. Data last updated 2019-04-21T19:58:51.697.Data deemed reliable but not guaranteed. © 2019 Willamette Valley Multiple Listing Service. All rights reserved. IDX information is provided exclusively for consumers' personal, non-commercial use and may not be used for any purpose other than to identify prospective properties consumers may be interested in purchasing. Information is deemed reliable but is not guaranteed accurate by the MLS or Matin Real Estate LLC | Inspire Realty, LLC. Data last updated: 2019-04-21T20:08:50.117. The listing data relating to real estate for sale on this web site comes in part from the Northwest Multiple Listing Service. Real estate listings held by brokerage firms other than Matin Real Estate LLC | Inspire Realty, LLC are marked by the "three tree" symbol; detailed information about such listings includes the names of the listing brokers. Data last updated 2019-04-21T20:13:52.483.